Red is my favorite color, it always has been and always will be! I used to LOVE chocolate milk when I was a toddler. LOVE IT. But then when I was in kindergarten, I switched to regular white milk because at school white milk was served in a red carton and chocolate was served in a brown carton. I legit have not drank chocolate milk since. That's how deep my love for red goes. What's funny though is that I don't have a lot of red in my wardrobe. 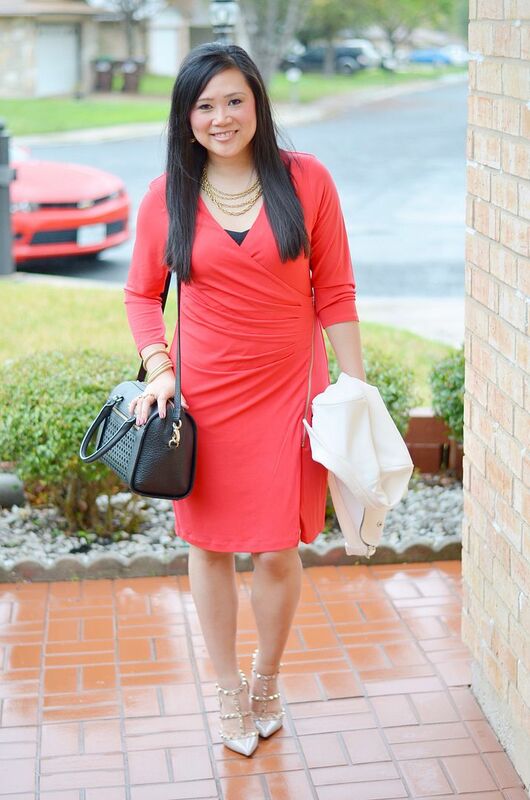 This post may make you think otherwise, but considering I've been blogging for almost 4 years now, you would think I would have accumulated more red outfits, especially since it is my favorite color! There's no real reason why red isn't more prominent in my closet, though I do feel that it can be tricky to style because it's such a statement color. If you're wanting to incorporate red into your holiday outfits, you've come to the right place because you can pull some inspiration from my post along with four other bloggers in this collaboration! Let's get started! 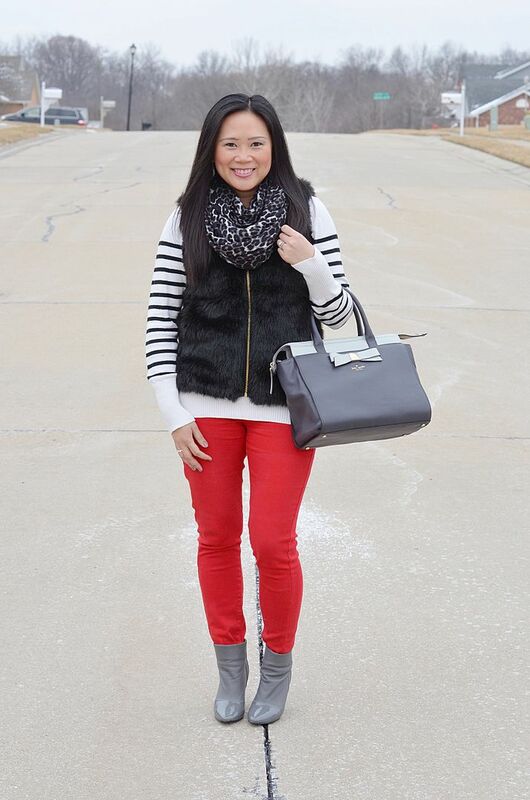 This outfit is so cozy, I think it would be perfect for a casual holiday gathering! I remember putting this outfit together and loving the way the grey booties grounded the outfit and gave it as much balance as it needed without fighting too much for attention with the vest and stripes up top! 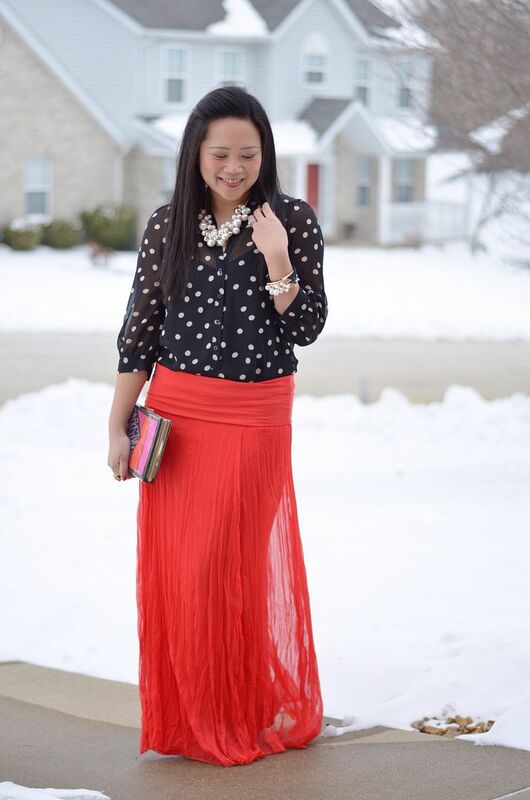 A red maxi skirt is certainly holiday-party worthy, especially when paired with other romantic pieces like a dotted chiffon top and chunky pearl baubles! Maxi skirts are the best because they're so effortless. I would almost venture to say they're even easier to wear than leggings, so long as you don't drink too much eggnog and trip over your hem! I lumped these three outfits together because even though they may be different pieces, I feel like they're the same outfit in terms of having the same outfit formula and similar color combo. Since these outfits feel a bit more like spring than they do fall or winter, I wanted to make sure I included tweaks to make them a bit more practical in the cooler months. Go big or go home, right? If you're fearless, you can always hunt for your perfect red dress. There's something that is inherently classic about a red dress, almost as much, if not more so than an LBD in my opinion! I definitely like to keep my accessories neutral in this case and let the dress just speak for itself! You can always do black tights and black booties if you don't want to go bare legged for the holidays! I'm not afraid of pairing red and green together whether it's the holidays or not! You can tone down the Christmas vibe a little bit by pairing the red with deeper evergreens or emeralds, or just snag a good green plaid top like this one that has some navy in it to help ground the outfit. And if none of these outfits are enough of a statement for you, why not pair two bold colors together like red and mustard? Everyone will be able to spot you a mile away! But seriously, despite these two colors being quite the head-turner when paired together, the combo does work. I don't know why I am picturing this as a fun hostess outfit for a casual get together. It's easy enough to run around the house in making sure your guests are ok, but it still makes quite the statement to remind people who is in charge of the show! 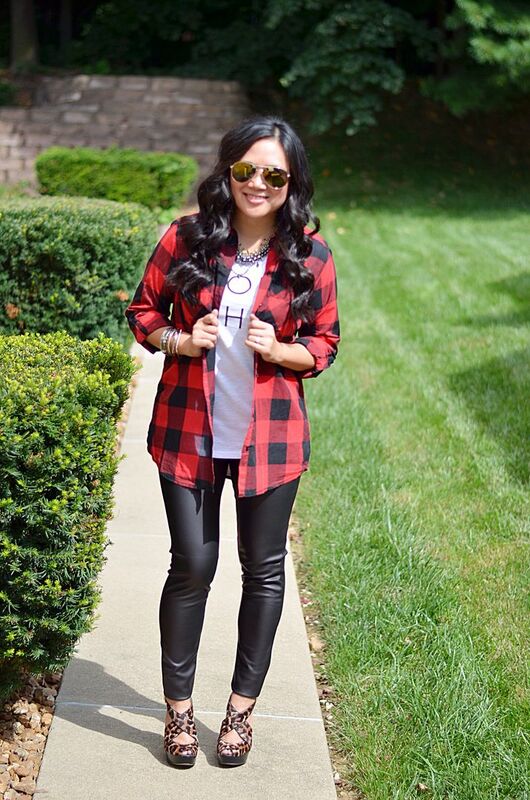 Buffalo plaid is one of my most favorite ways to wear red, and for some reason, it's a lot easier to style the red when it's in the form of plaid. Pairing the more country feel of the plaid with more urban pieces like the faux leather leggings and animal print shoes is so fun for me. After I saw this outfit, I realized I needed to wear it again stat. If I'm being completely honest, my most favorite way to wear red is by simply doing pops of the color. 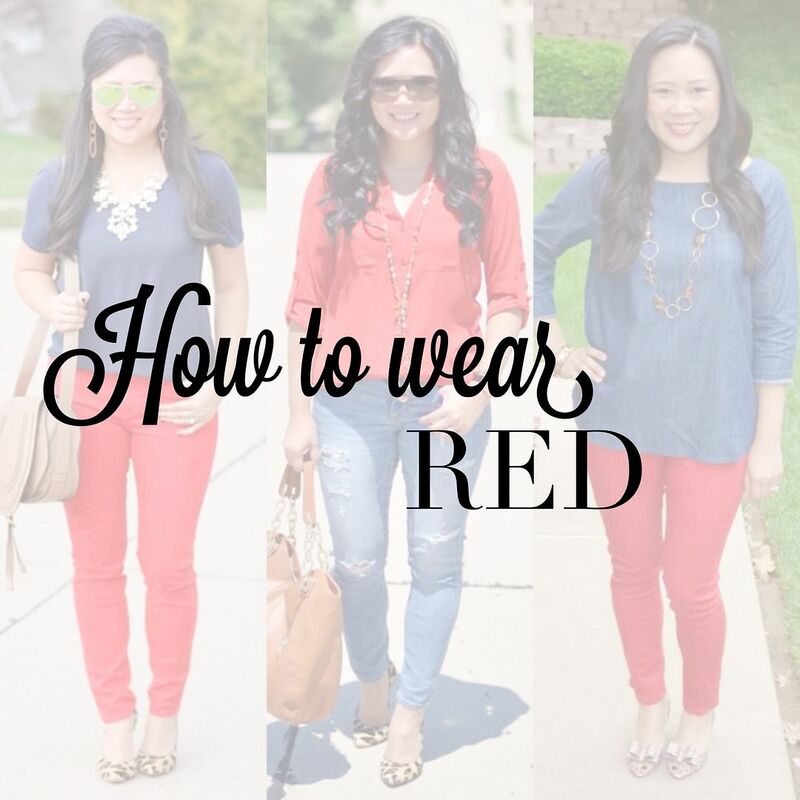 I do love each and every outfit in this post, but for me, when it comes to red, I feel like a little goes a long way and sometimes little focal points of red make an ever bigger statement in smaller doses. That said, I had to include this outfit into the mix so you can see that you don't *have* to be a walking billboard for red if you don't want to! 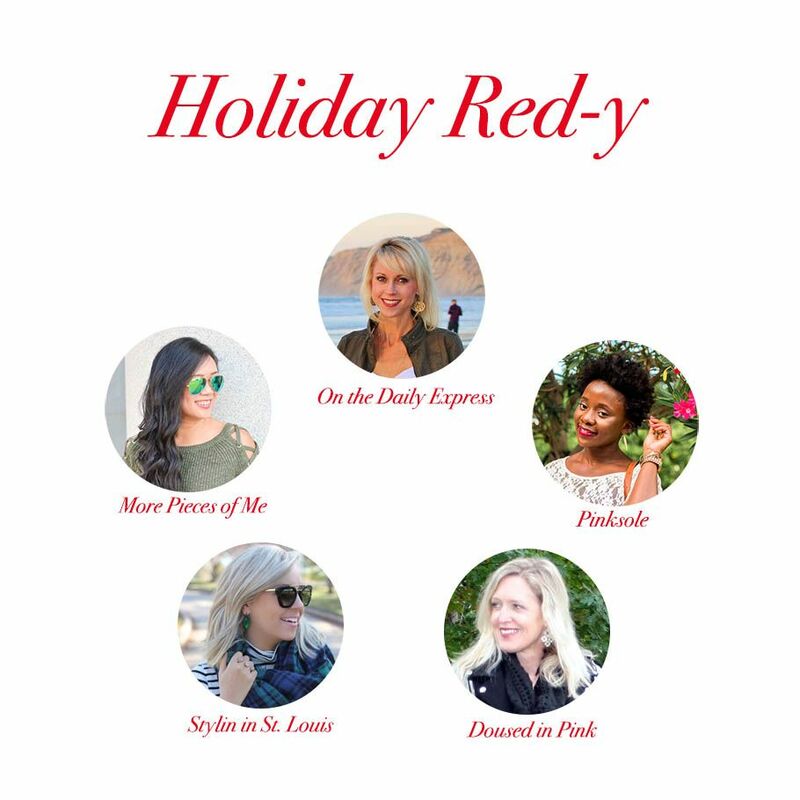 To see how each of the ladies in this collaboration are styling red this holiday season, stop by their blogs using the links below the image above! You can also loop your way through each blog in the series by heading to Gina at On the Daily Express next! YES to all of these outfits!!! You look so great in red! Thanks for hosting the linkup! 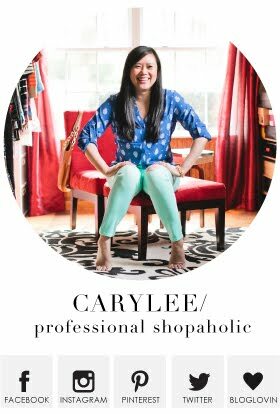 you for sure have more red than me but I do need a buffalo plaid top, I wish express would bring it back. All so cute! That red dress is total perfection on you! 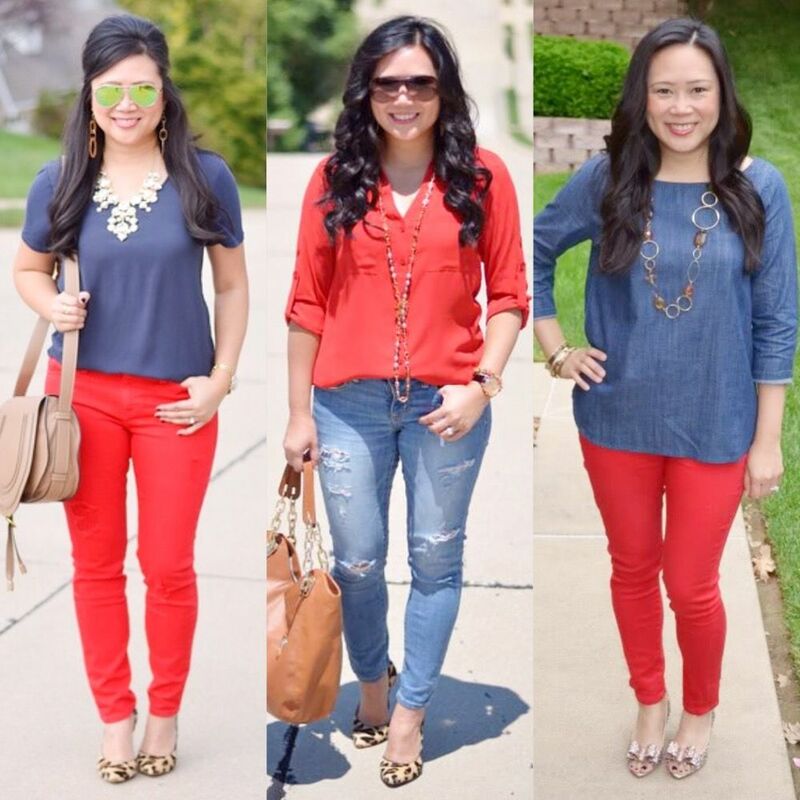 You look gorgeous in red and all of these outfits are so cute! I need more red in my closet! How have I known you this long and not known that red is your favorite color?? I knew you liked it for Cardinal reasons but I had no idea it went back to white vs. chocolate milk! (LOL...love that story.) And now more than ever I want a buffalo plaid top to re-create that outfit! I've been wanting to step up my game with my red skinnies and haven't been able think of good outfits. Love the ones you've worn! Great inspiration! LOVE that red wrap dress- what a stunner! LOVE! Red is one of my favorite colors too but I barely wear it. I use it as an accent instead but this has made me want to wear it today. Thanks for sharing the inspiration! Red is my favorite color too...has been for as long as I can remember! LOL :) I love your variety of outfit choices. Great idea! Pops of red are so fun. I definitely need more in my wardrobe! You look great in red! It can be such a hard color to pull off, but it was made for you! You always look good in red. I love that long red skirt! WOW, these are GREAT! Love the options, pushing me to get more red in my life!! Love the pattern mixing in the last photo, I need this look! Love all the red! That long red skirt is a showstopper and I love that red pencil skirt/plaid combo! Perfect for the Holidays! You look beautiful in red and it matches your fun, bubbly personality! I think it intimidates a lot of us, but it's the greatest power color out there and a huge mood boost! I am just loving all the ways you have worn red! You are adorable! Love this post! I love red too!!! 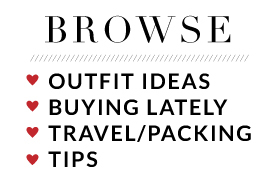 Such cute outfit ideas!